Train travel in Tunisia . . .
Fast air-conditioned railcar with Express Class seating. These modern units operate the trains shown as 'Ex' in the timetable below.. 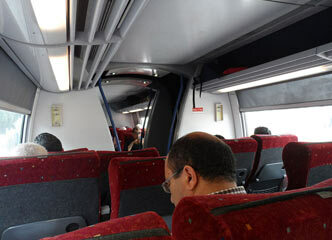 The Tunisian Railways (SNCFT) are easily the best way to travel between Tunis, Sousse, El Jem, Sfax and Gabès. There is also a branch line from Sousse to Monastir and Mahdia, and several other routes. Trains are comfortable, modern and air-conditioned. Marseille-Tunis, Genoa-Tunis: Corsica Linea (French) & CTN (Tunisian), www.corsicalinea.com. Genoa-Tunis: Grandi Navi Veloci: www.gnv.it. Société Nationale des Chemins de Fer Tunisiens - www.sncft.com.tn. UK citizens do not need a visa to visit Tunisia. There is a light railway (run by SMLT) linking Tunis centre, La Goulette (for the ferry terminal to Marseille and Genoa), Carthage (for the ancient ruins & Byrsa Hill) and Marsa Plage. 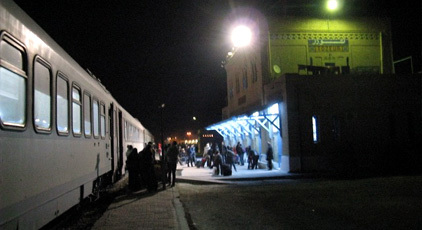 Departures are at frequent intervals from 04:00-00:50 and the fare about 0.7 dinars (UK £0.35). 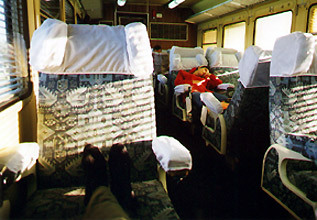 Tunisian trains have 3 classes of accommodation: 2nd class, 1st class and Classe Confort, although modern railcars delivered in 2008 have just one class, called Express. 2nd class is perfectly adequate, 1st class very comfortable. Classe Confort is very similar to 1st class, but with even more space, as seats are arranged 2+1 rather than 2+2 across the car width, see the photos below. The overnight trains have no sleeping berths, just seats. Check the latest train times at the SNCFT website, www.sncft.com.tn - click the UK flag, the English version finally works! Sousse Ville is in central Sousse. Sousse Kalaâ Séghira station is 7.6 km (4.8 miles) west of Sousse and is easily reached from the town centre by louage (shared taxi), see map showing station. Bir Bou Rekba station is 5.7 km (3.5 miles) from the popular resort town of Hammamet, see map showing station. x = regular electric trains link Sousse Bab Jedid station (500m walk from Sousse Ville station) with Monastir & Mahdia every half-hour or so through the day. C12 = Air-conditioned rapide with Classe Confort and 1st & 2nd class seats, see the photos below. Ex = Modern air-conditioned express railcar with Express Class seating, see the photos below. Au = Autorail = railcar with 1st & 2nd class. 98km, journey 1 hour 35 minutes, 2nd class only. Departures from Tunis at 05:55 (Mon-Fri only), 11:55, 14:30 (Fri & Sat only), 16:10 (daily except Fri & Sat), 18:25. Departures from Bizerte at 05:40 (Mon-Fri only), 08:20, 14:15, 18:35. See www.sncft.com.tn. Trains leave Tunis at 06:02 and 14:15 arriving at Kalaâ Kasbah at 11:05 and 19:11 respectively. Returning, trains leave Kalaâ Kasbah at 05:45 and 12:45 arriving Tunis at 10:32 & 17:35 respectively. See www.sncft.com.tn. There is no railway station at Kairouan, but regular SNTRI buses run from Sousse to Kairouan taking 1½ hours, and from Tunis to Kairouan every hour taking 2¼ hours. There are also shared taxis ('louages') from Sousse to Kairouan about every 30 minutes throughout the day. 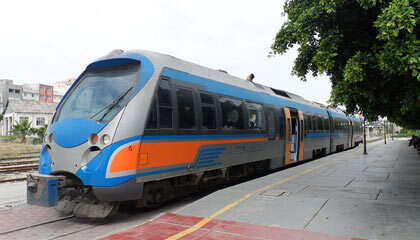 Tunisian railways has an official website at www.sncft.com.tn. 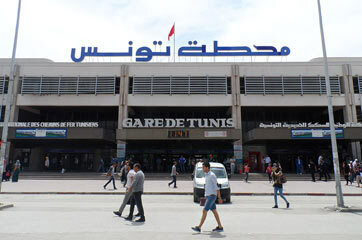 It's easy to book Tunisian rail tickets at the main station in central Tunis - bookings only open 3 days in advance, so don't worry about pre-booking before you get to Tunisia. £1 = approx 2.7 Dinars. $1 = 1.7 Dinars. Children aged 0 to 3 travel free, children 4 to 9 travel at 75% of the adult fare, children 10 and over pay full fare. 10-day return tickets carry a discount of 15% over the cost of two one-way tickets. A Tunisian rapide on the Tunis-Sousse-Sfax-Gabès line. Comfortable, although not kept as clean as they used to be... Courtesy of James Merriman. The overnight rapide from Tunis, arrived at Tozeur. Photo courtesy of Neil Bastock. Tunis station. Photos courtesy of James Merriman. Express railcar, used on the services marked Ex in the timetable above. Courtesy of James Merriman. Tunisian Railways offer an excellent Carte Bleue railpass for 7, 15 or 21 days for unlimited travel in 1st class, 2nd class or classe confort. Prices for a 7-day pass are around 40 dinars 2nd class, 56 dinar 1st class, 60 dinar classe confort. Prices for a 15-day pass are twice the 7-day price, 21-day prices are three times the 7-day price. Although the pass gives you unlimited travel, you still need to pay a small air-conditioning supplement for travel on any air-conditioned train, which means almost all the long-distance ones. In 2nd class the supplement is 0.7 dinar for up to 100km, 0.9 dinar for 101-160km, 1.4 dinar for 161-300km and 1.8 dinar for over 300km. Just pay this supplement at the ticket office before making each journey using the pass. 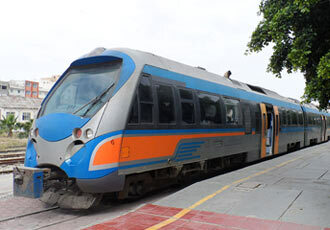 Carte Bleue railpasses can be bought at Tunisian railway stations. Officially, you need a passport-sized photo to buy these railpasses, but reports suggest that a passport is sufficient as they then write your passport number over the photo square. Feedback is always appreciated. The pass covers all mainline SNCFT trains, but not the Tunis-Carthage light railway or the Tunis tram system. A privately-run tourist train called the Lézard Rouge runs from Metlaoui to the Gorges de Selja, a 40 minute, 43 km ride through spectacular scenery. It runs from 1 May to 30 September, daily except Saturdays, departing Metlaoui at 10:00 on Tues, Thurs & Sun or 10:30 on Mon, Wed & Fri, arriving at Gorges de Selja 40 minutes later, departing Gorges de Selja after a 20 minute stop and arriving Metlaoui 45 minutes later, total trip length around 1 hour 45 minutes. The fare is 20 dinar for adults, 12.50 dinars for children under 10, children under 4 free. For information go to www.sncft.com.tn, click the UK flag for English then Idea for Discovery at the top then Products then Lézard rouge. Now repeat this process in the French version of their site to get to the French language page for the Lézard rouge as this has much more useful information including departure times! Note: In October 2009, flooding destroyed the railway line through the Selja Gorge used by the Lézard Rouge. However, the Lézard Rouge is now up and running again. Comfortable cruise ferries link Tunis with Marseille & Genoa (several weekly) and Tunis with Sicily (once per week). See the London to Tunisia page. 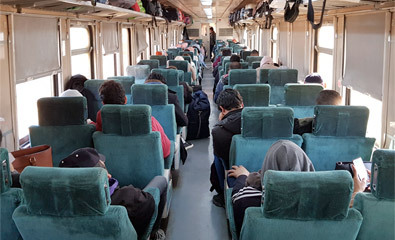 Trains no longer operate across the border, but you can take a train several times a day from Tunis to Ghardimaou (Tunis to Ghardimaou takes 3h15, 4 trains per day) which is the closest town to the Algerian border, just 11.4 km from it. See www.fco.gov.uk for travel advice on Algeria. See www.sncft.com.tn for train times to Ghardimaou. For train travel in Algeria, see the Algeria page. Although the border is open and there are bus services (but no trains) across Libya from the Tunisian border to the Egyptian border, the Libyan government does not grant visas to independent travellers, only to visitors on organised tours or whose travel is organised by a recognised Libyan tour agency. The Hôtel Majestic on the main Avenue de Paris in Tunis has the best French colonial facade in town and is a great place to stay, see www.booking.com/hotel/tn/majestic.en.html. It was closed for refurbishment for a while, but has now reopened in 2011. It's comfortable and central, and rooms with en suite facilities cost around £20 per night. You should take a good guidebook. 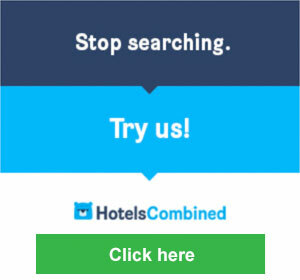 For the independent traveller this means either the Lonely Planet or the Rough Guide. I personally prefer the layout of the Lonely Planets, but others prefer the Rough Guides. Both provide excellent practical information and historical background. You won't regret buying one! The European Rail Timetable has train, bus and ferry times for every country in Europe, It costs around £15.99 from www.europeanrailtimetable.eu.